The unsung heroes of Britain’s blue light services have been honoured in the first national awards for control room staff. The APD Control Room Awards 2018 celebrate the extraordinary and selfless contribution of behind-the-scenes staff who play a critical role in the response to emergency incidents day in and day out, often dealing with harrowing and distressing situations. Among those recognised were control room staff who supported the response by London Fire Brigade to the Grenfell Tower inferno, which claimed 71 lives. The brigade’s Two Watch control room team was named Team of the Year for their work on the night of June 16, 2017, when they took more than 370 calls within a four-hour period, the majority from people inside the tower facing desperate situations. The team remained calm and clear and used their training to provide advice and guidance to help as many people as possible escape the burning building. Team members never wavered from their task, answering calls and supporting people trapped in the tower, including those with little or no hope of survival. They maintained focus throughout, supporting each other to carry on under unremitting pressure. Since that fateful night, Two Watch members have supported firefighters who tackled the blaze in fund-raising events and have attended memorial services to support the Grenfell Tower survivors. The Control Room Awards also recognised a series of individuals for their remarkable work. Sanchez Singh, from Greater Manchester Police, who gave up his own time on New Year’s Eve and used his language skills to help a family to understand and grieve at the loss of a missing person who had sadly drowned. David (Edd) Redwood, of Cornwall Fire and Rescue Service, who demonstrated exceptional performance and collaboration with several services in the multi-agency management of a flash flooding situation and helped save the life of an elderly woman trapped in rapidly-rising floodwater. Leanne Ross, from Police Scotland, who showed exemplary call-handling skills in dealing calmly and effectively with an extremely traumatic incident in which critical injuries had been inflicted by a suspect armed with a chainsaw. Julie Burgess, from Devon and Cornwall Police, who showed phenomenal bravery during an incident on her way home from work. Julie put herself in imminent danger to single-handedly save the life of a young man threatening to throw himself from a bridge. Also recognised as part of the Control Room Awards was Danny Herbert, who at just seven years old has spent time across the force at Sussex Police - including as a radio controller. Danny has always wanted to be a policeman and has not allowed his heart condition to stop his dream from coming true. His colleagues nominated Danny for the Dispatcher of the Year, and the judges were delighted to crown him with an honorary award in this category - highly commending his work and bravery. The first national awards to celebrate the life-saving and life-changing work of staff in critical control rooms are run by APD Communications, which develops critical, life-saving software used by the police and other emergency services organisations across the country, as well as transport and aviation operators nationally and internationally. The winners were chosen from more than 200 nominations and announced at an inspiring awards ceremony held at the De Vere Orchard Hotel in Nottingham. APD Managing Director Mike Isherwood, one of the Control Room Awards judges, said: “It has been deeply moving and truly humbling to hear so many accounts of how control room staff keep the public safe and secure, day after day. “It was such a difficult task to select the winners from so many excellent nominations. There were nominations for extraordinary individuals and teams who make an invaluable contribution to emergency services organisations and society as a whole. “We know they represent hundreds of people in control rooms right across the country who perform their duties with such care, commitment, professionalism and resilience. Leading tech company telent Technology Services is the Platinum Partner of the awards, with pioneering technology companies Sopra Steria and Seed Software as Bronze Sponsors. British APCO (Association of Public Safety Communications Officials) and the International Critical Control Rooms Alliance (ICCRA) also backed the awards, while critical communications data capture, storage and analysis specialist Red Box Recorders sponsored the Team of the Year award. Barry Zielinski, telent’s General Manager, Public Safety & Defence, said: “Congratulations to all the winners and the nominees for representing public service at its very best. 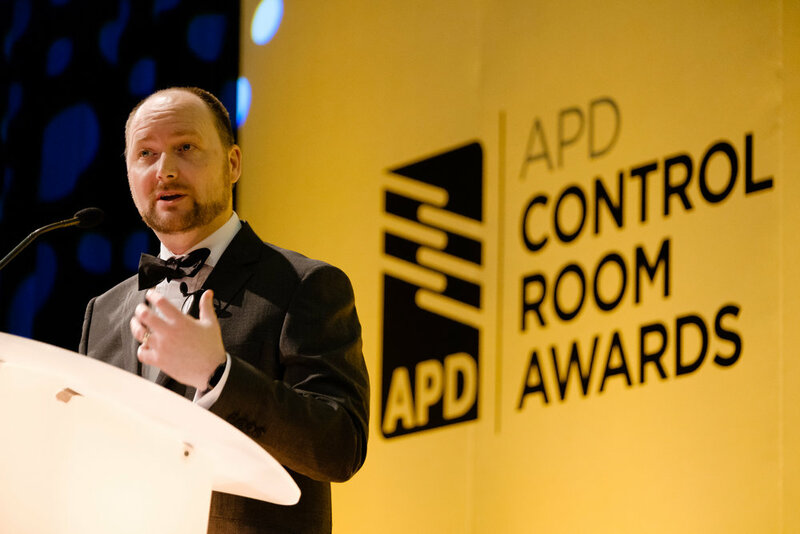 The full list of APD Control Room Awards 2018 winners is below. Dedicated posthumously to John Gilhooly who served in the Scottish Ambulance Service control room for almost 30 years. Mike Isherwood, Managing Director, APD Communications. Chris Dreyfus-Gibson, Vice Chairman, International Critical Control Rooms Alliance (ICCRA). Sue Noyes, former Chief Ambulance Officer and Chair of The Ambulance Staff Charity (TASC). Cheryl Rolph OBE, former Assistant Chief Fire Officer and Director of Networking Women in the Fire Service. Ian Thompson, Chief Executive of British APCO (Association of Public Safety Communications Officials). Barry Zielinski, General Manager, Public Safety & Defence, telent.